The Maui Trailblazer guidebook is a very good Maui travel guide for travelers willing to discover the island through outdoor adventures. The guidebook has been around for quite a while now and has gained a strong credibility among Maui Hawaii lovers. Thanks to Jerry and Janine Sprout's straightforward approach. No fluff, just good relevant information (bring you mouse over the book cover below and click on the yellow stars to see consumers feedback). Maui Trailblazer has found its niche covering Maui Hawaii outdoor activities and it's doing a pretty good job at it. Keep in mind that Maui Trailblazer is not a cover-it-all Maui travel guide. I would not recommend visiting Maui with this single guidebook in hands. That being said, when coupled with an excellent guide like Maui Revealed or the all-around Fodor's Hawaii guidebook (see my Top 3 Maui guidebooks page for more details) you end up with a very efficient and complementary package. When you look at Maui Trailblazer in a general features point of view, you quickly find out that this Maui travel guide has quite a lot to offer. 137 different hikes and strolls to tropical rain forests and ridges, remote valleys, coastal bluffs and lava caves, Hana Highway, Haleakala crater, cascading waterfalls, beaches, whale-watching spots, historic sites and archeological ruins, museum, gardens and more. 44 snorkeling spots: beaches, reefs and marine reserve including Molokini. 38 beaches for surfers, windsurfers and kite surfers to choose from plus kayak put-in suggestions. 10 maps and 8 driving tours to explore Maui's hidden treasures. Over 200 photographs… and a lot more to discover. As you can see, there is a lot in this guidebook to please us, Maui travelers. But Trailblazer is not the only Maui travel guide to provide a lot of information about Maui's outdoors activities. In my eyes, the guidebook's real value hides inside one central and very handy feature: its trailhead system. The authors don't explicitly call it this way, but I thought it might be easier to explain with a name. So I named it! Let me show you what I mean. Almost all of Maui Trailblazer's content is linked to a series of trailheads. There is a total of 52 trailheads. More than enough to keep you active for months. The trailheads are grouped in 5 distinct regions. This organization makes it very easy for you to select the outdoor activity you want to do. You starting point is the Master Map. From there, you select a region (Valley Isle, Windward Coast, Sunny South, Hana Highway or Haleakala). Then, you head to the corresponding section of the guidebook where a dozen of suggestions await you. Each section is very well laid out. A detailed map shows all the trailheads available with clear corresponding numbers. Almost each trailhead provides hikes of varying lengths (from a short family walk to a strenuous trek) as well as water sports suggestions (snorkel, surf, windsurf, etc.). All you have to do is to pick the one that looks good to you. To help you make a decision, some extremely helpful information are provided: the closest parking lot and how to get there as well as the exact hiking distances (in miles) and elevation (in feet). When you find yourself on the field, these specific information prove to be invaluable. Even with a great system like the trailheads, it can be hard to decide what to do, especially if you are visiting the island on a short vacation. If you are like me, you don't want to miss the best parts and you wish you could pick the top activities. Fortunately, the Maui Trailblazer guidebook provides a small but very cool section called: The Best of Maui. This section is located at the very beginning of the Maui travel guide, before the trailhead directory. I keep going back to it when I don't know what to choose. On these pages, the authors point out what they consider to be the not-to-be-missed things to do on Maui Hawaii. They even sort their favorite picks in different categories: Best rainforest hikes, best trails with a view, Best family outings, Best hike-to-coves, etc. No need to say how helpful this section is. In addition to the Best of Maui section, Maui Trailblazer offers another handy section devoted to families. Once again, the clear and simple suggestions, sorted by categories, make your reading a breeze: Best nature walks suited for kids, Best beach to swim in calm waters, Best attractions to captivate the youngsters (aquarium, state park, etc.) and many more. This is one great tool for an exciting family vacation. Among all of those suggestions, you are sure to find an activity that will please the whole family. Obviously, this quick review doesn't cover the entire guidebook's content. But the good news is tons of other Maui travelers have bought and tried the Maui Trailblazer and many have shared feedback. Their opinion on this Maui travel guide is available to you in a couple of clicks. Simply bring your mouse over the book cover provided at the top of this page and wait a second or two. A small box will pop-up and the number of reviews and the overall rating of the book will appear. Click on the yellow stars to get more details and read the full reviews. This should give you a solid second opinion. You can do this with every guidebook found on the Maui Hawaii Guidebooks Complete List. 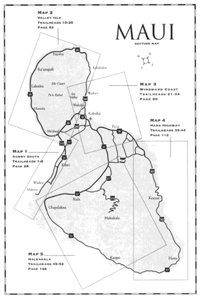 The Maui Trailblazer guidebook covers the neighboring islands of Molokai, Lanai, and Molokini. If Maui is not the only Hawaiian island you plan to visit, I strongly suggest you take a look at the entire family of Trailblazer guidebooks. They are all good travel guides for you, especially if you are looking for outdoor activities. Here are direct links to the guidebooks on Amazon. Take a look at consumers reviews and use the Look inside feature to get a preview. Looking for More Maui Hiking Guidebooks? Here are some additional hiking Maui guidebooks. Browse the list below but keep in mind that the Maui Revealed guidebook and the Maui Trailblazer guidebook (both part of my Top 3) are probably the best hiking guidebooks you can find. If you prefer to get even more suggestions, browse through my Maui Hawaii Guidebooks Complete List. Not sure what Maui travel guide to choose? Need advice? Have a look at my Top 3 Maui Travel Guide page.